Zubin Mehta has been named Conductor Emeritus of the Los Angeles Philharmonic. Simon Woods, CEO of the orchestra, announced the news from the stage of Walt Disney Concert Hall before the second half of last night’s concert in which Mr. Mehta was beginning his second week of Brahms programs this season. Given that Mr. Mehta’s relationship with orchestra goes back to 1961, this is a case of better late than never. He was originally supposed to be Assistant Conductor of the orchestra under then-Music Director Designate Georg Solti; however, Mr. Solti was never consulted about that appointment and resigned in protest without ever officially serving as Music Director. Soon after, Mr. Mehta was named as Music Director of the LA Phil and served in that role from 1962 to 1978, the longest tenure of anyone until Esa-Pekka Salonen’s 17-year stint during the turn of the 21st Century. Mr. Mehta has made regular appearances with the orchestra ever since. Speaking of Mr. Salonen, the LA Phil’s website still lists him as holding the title of “Conductor Laureate.” I’m guessing The orchestra has confirmed that he’ll retain that title even after he takes over the reigns of the San Francisco Symphony in 2020. Los Angeles, CA (January 3, 2019) —Los Angeles Philharmonic CEO Simon Woods tonight announced from the stage of Walt Disney Concert Hall the appointment of Zubin Mehta as Conductor Emeritus of the Los Angeles Philharmonic. “From the earliest stages of my career, I have been proud to call Zubin Mehta a trusted mentor and friend. To follow in his footsteps as music director of the Los Angeles Philharmonic is a true honor. His soul permeates the sound of the orchestra, and his connection to the musicians is profound. Zubin is one of the greatest musicians of our time. He has conducted the world’s most esteemed orchestras and introduced generations to classical music with more than 50 years of recordings and breathtaking performances. Through his humanitarian work, he has given us a model of music’s ability to bridge cultures and bring people together in healing and in harmony. Zubin Mehta was appointed LA Phil Music Director at the age of 26, making him its youngest Music Director at the time of his appointment. During his 16 seasons in Los Angeles, he was intent upon breaking down cultural and social barriers pervasive in the orchestral music world and positioning the orchestra as a resource for the entire community. 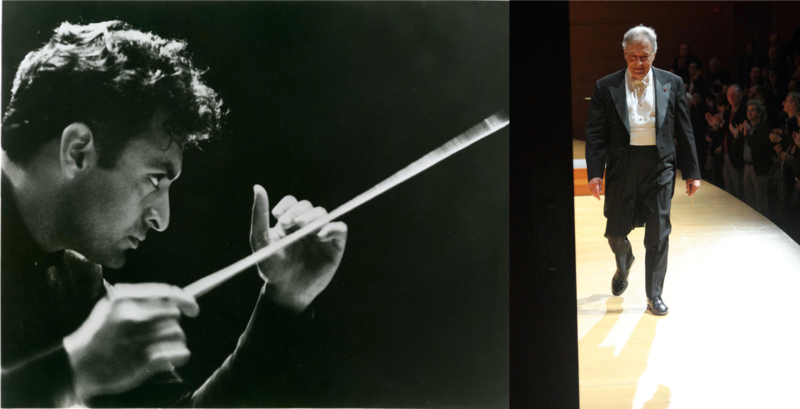 Under Mehta’s leadership, the LA Phil appeared with Frank Zappa and the Mothers of Invention at UCLA, performed free concerts in African American and Latino communities, and moved from Philharmonic Hall to the new Dorothy Chandler Pavilion. He was presented with the Los Angeles Philharmonic Distinguished Service Award in 2006 and celebrated the 50th anniversary of his music directorship with the LA Phil in 2012. It was during that anniversary concert that he received a proclamation from Los Angeles County designating Dec. 13 Zubin Mehta Day. Following his time in Los Angeles, Mehta served as music director of the New York Philharmonic for 13 years, the longest in the orchestra’s history. During his decades as a conductor, Mehta has been hailed not only as a masterful musician, but also as an important humanitarian ambassador, bringing together cultures and countries in conflict through the power of music. Mehta first conducted the Israel Philharmonic (IPO) in 1962, became its Music Director in 1977 – and became music director for life in 1981. Zubin Mehta will return to perform with the Los Angeles Philharmonic as Conductor Emeritus in the 2019/20 season. Click here to view Zubin Mehta tribute video. ZUBIN MEHTA was born in 1936 in Bombay and received his first musical education under his father Mehli Mehta’s guidance. After a short period of pre-medical studies in Bombay, Zubin Mehta left for Vienna in 1954, where he eventually entered the conducting program under Hans Swarowsky at the Akademie für Musik. Mehta won the Liverpool International Conducting Competition in 1958 and was also a prize-winner of the summer academy at Tanglewood. By 1961 he had already conducted the Vienna, Berlin, and Israel philharmonic orchestras, and he has celebrated 50 years of musical collaboration with all three ensembles. He has conducted over 3000 concerts with the Israel Philharmonic Orchestra, including tours spanning five continents. Mehta ends his tenure with the IPO 50 years after his debut in October 2019. From 1985 to 2017, he was chief conductor of the Orchestra del Maggio Musicale Fiorentino in Florence. Zubin Mehta’s list of awards and honors is extensive. The title of “Honorary Conductor” was bestowed on him by the following orchestras: Vienna Philharmonic Orchestra (2001), Munich Philharmonic Orchestra (2004), Los Angeles Philharmonic (2006), Teatro del Maggio Musicale Fiorentino (2006), Staatskapelle Berlin (2014), and Bavarian State Orchestra (2006), with which he performed in Srinagar, Kashmir in September 2013. In March 2011, he received a special distinction, getting a star on Hollywood Boulevard. The Indian Government honored him in September 2013 with the “Tagore Award” for cultural harmony, which a year earlier was awarded to Ravi Shankar. Mehta continues to support the discovery and furtherance of musical talents all over the world. Together with his brother Zarin, he is a co-chairman of the Mehli Mehta Music Foundation in Bombay, where more than 200 children are educated in Western classical music. The Buchmann-Mehta School of Music in Tel Aviv develops young talent in Israel and is closely related to the Israel Philharmonic Orchestra, as is a new project of teaching young Arab Israelis in the cities of Shwaram and Nazareth with local teachers and members of the Israel Philharmonic Orchestra. The LA Phil, under the vibrant leadership of Music & Artistic Director Gustavo Dudamel, presents an inspiring array of music from all genres – orchestral, chamber and Baroque music, organ and celebrity recitals, new music, jazz, world music, and pop – at two of L.A.’s iconic venues, Walt Disney Concert Hall (laphil.com) and the Hollywood Bowl (hollywoodbowl.com). The LA Phil’s season at Walt Disney Concert Hall extends from September through May and throughout the summer at the Hollywood Bowl. With the preeminent Los Angeles Philharmonic at the foundation of its offerings, the LA Phil aims to enrich and transform lives through music, with a robust mix of artistic, education, and community programs. Tags: Esa-Pekka Salonen, Zubin Mehta. Bookmark the permalink.